17. 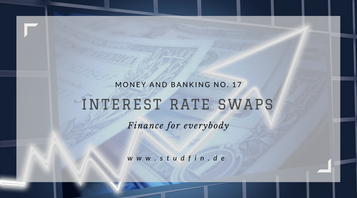 Interest Rate Swaps - Studfin - Einfache Geldanlage! “He (Mario Draghi) hinted markets were right to bet against the ECB increasing interest rates before 2019, saying repeatedly that low interest rates would remain in place […].” What are the impacts of high or low interest rates for companies that borrow money based on a floating rate and how can they hedge the risk of rising interest rates? Here is an easy explanation of how to hedge interest rate risk with an interest rate swap. Imagine I am a company making a big investment. I want to build a new factory for 100 Million Dollar and I need to borrow money. Currently, the economic situation seems to be a little bit unstable and due to the fact that I need to borrow a big chunk of money, I am only able to borrow at the flexible LIBOR Rate plus 0.5%. (The LIBOR is the rate at which banks would lend money to each other, the rate is set every morning by the big banks). Furthermore, the bank is willing to take the interest rate risk for the company by changing a fixed interest rate for a variable one. (Banks are giving away credits based on the LIBOR so a flexible interest rate is almost better than a fixed interest rate). Therefore the bank borrows $100 Mio. at an interest rate of 5.25% and the company borrows $100 Mio. at the LIBOR plus 0.5%. Both parties "give" their interest rates to the dealer and the dealer gives a fixed exchange rate of 5.75% to the company, so the company borrows their $100 Mio. for 5.75% instead of 6% and the bank pays only the LIBOR instead of the LIBOR plus 0.25%. (The dealer will probably get some basis points or a provision for that deal, but for simplicity, we do not take this into our calculation). Both parties can borrow for less and the company does not have to worry about interest rate risk. Both parties still own the $100 Mio. to their own creditors. They have only exchanged their interest rates. From now on they have to pay the net of the interest rates to the other party. So if the LIBOR is below 5.75% the company has to make a payment to the bank and vice a verse. Isn't that a free lunch or arbitrage opportunity? Not really because there is a counterparty risk. One party could get insolvent and not be able to meet the interest rate payments. Financial Times Article: As we see in the diagram even though Mario Draghi and the European Central is not rising interest rates at the moment, because they are afraid they will slow down the European economy because borrowing will become more expensive and people that have not hedged their interest rates might get into trouble because they would have to pay higher interest rate payments. These interest rates swap market is huge the notional volume and trade count grew in 2016 versus the previous year. Notional volume rose to $166.2 trillion, marking a 16.9% increase over 2015, when volume totaled $142.3 trillion and these transaction are off-balance sheets transactions. Therefore there are hard to spot and can cause an unexpected financial risk. The second article: Why do we need banks? The third article: Why we need a central bank? The fourth article: How can banks create money out of thin air? The fifth article: Why do we need central banks especially in a crisis? The sixth article: What are clearing houses? The seventh article: What are Fed Funds? The eighth article: What are dealers, brokers and repos?